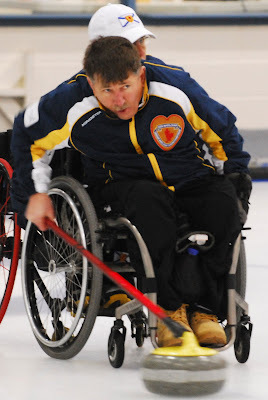 Team USA skip Goose Perez skipped an international team of Tammy Delano and Ottawa's Katie Paialunga to victory in the 4 day Cape Cod CC Wheelchair Summerspiel, lifting the Colaccio Wheel Challenge Trophy after beating Carl Marquis and Team Quebec in Sunday's final. Club coach Tony Colaccio, who saw 4 years of fundraising and renovation effort come to fruition with this inaugural wheelchair spiel, told the Cape Cod Times he hopes the event will grow. "Then the problem will be finding accessible accommodation." You can read a report from the event HERE and see a gallery of photos HERE. The inaugural Wheelchair Summerspiel at the Cape Cod CC in Falmouth MA attracted 6 teams, including Team USA, Team Germany and Team Quebec. The four day event began on Thursday (22nd) and featured a full round robin with the final for the Colaccio Wheel Challenge Trophy to be played Sunday 25th at 9.30 am. 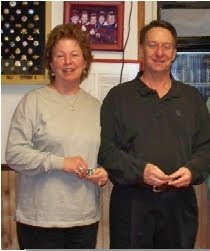 Past president Tony Colaccio and president Mary Colaccio began working in 2006 to raise the funds to make the club accessible, and it is encouraging to see their commitment not only bring local wheelchair users into the club, but also attract such an international field to a summer event. Team Nova Scotia 3rd Laughie Rutt was nominated by the NSCA as Nova Scotia Male Athlete of the Year, and Team Nova Scotia coach Glen McClare received a nomination for Coach of the Year. Wheelchair curling begins at the Lakeshore CC on Sunday October 3rd with an open "Give-It-A-Go" session from 10am till 2pm. The provincial team will attend and the session is open to any wheelchair user interested in finding out what it's like to curl. Able-bodied curlers interested in starting a program at their club, or volunteering at the regularly scheduled Saturday afternoon sessions, 3-5pm starting October 9th, are also welcome. Contact the club at 902-864-CURL, or Laughie at 902-864-2737 and ask to be added to his email news and announcement list. The U.S. Curling Association is sponsoring an open weekend wheelchair curling camp at the Green Bay CC. Present Team USA members will be in attendance, and wheelchair users will be able not only to learn about the sport but also discover what it takes to try out for Team USA. For more information contact Marc DePerno and download the event brochure from this link. Team Canada skip and Paralympic gold medalist Jim Armstrong's jury trial before Judge Martinez has been put back to August 30 at the U.S. District Court in Seattle WA. Armstrong is charged with his son Gregory with trafficking in counterfeit goods and selling and dispensing counterfeit drugs with the intent to mislead or defraud. He was arrested at a mail service in Blaine WA in April when picking up a package containing 2,800 fake Viagra and Cialis pills, and is free on $20,000 bond. The charges carry a maximum 10-year prison sentence and $2-million fine. For background on the case see the links on this post. Against expectations. the CCA says funding from both Own The Podium and Sport Canada will increase for the coming season. "This means," said a very happy Gerry Peckham, the CCA high performance coach in overall change of the program, "that we will be able to enhance both grass root and high performance development via expanded programs and services." The top six wheelchair athletes at the end of the assessment year in June receive funding for the following year through the carding system; a monthly training stipend. The five members of the gold medal team receive full cards: Jim Armstrong, Darryl Neighbour, Ina Forrest, Sonja Gaudet, and Bruno Yizek. Bruno trades places with Chris Sobkowicz who now receives funding at "development" card level. Sport Canada will monitor Jim Armstrong's future eligibility as events relating to his upcoming trial unfold.